Our leaders cannot comprehend what is going on, either when a whole Western civilization loses its faith and moral standards or when Islam reawakens to the implications of its own faith and its vision of world conquest. Political realism, long associated with Augustine, constrains us to consider what Machiavelli later recommended to us—namely, to look at what men “do” do and not at what they “ought” to do. This advice would be more persuasive if, in fact, some men did not do what they ought to do or others do what they ought not to do. Both sides usually persuade themselves that they ought to follow their convictions. Machiavelli thought that if men did what they “ought” to do they would not survive the onslaughts and cunning of those who did what they had power to do whatever they could do. However, Augustinian realism did not, as in the case of Machiavelli, justify this careful look at what men “do” do as a reason to deny the distinction between good and evil so that any means could be used to accomplish their purposes. The “realistic” look was “realistic” for Augustine precisely because good and evil were included in the look itself, in the reality as seen. To see and act on the reality of good or evil is to see reality in its fullest dimensions. Practical truth, in terms of acting according to an accurate description of what is there, is the first principle of realism as well as of political action. Thus, Maritain could rightly maintain in the Augustinian tradition that “justice, brains, and strength” need not be separated. They belong together. Or, to refer obliquely to Lord Acton, the lack of power can also corrupt absolutely. Not to possess and use responsible power in defense of what is right is itself an evil, a cowardice. With this background in mind, we recall recent events from “9/11”, the bombings in Spain, England, Mumbai, Bali, Fort Hood, San Bernardino, twice in Paris, Lahore, and Brussels, not to mention the persecutions and beheadings in Pakistan, Iraq, Yemen, Nigeria, Libya, Somalia, Chad, Syria, and the Sunni/Shiite inner-Muslim battles. What is the most plausible way to judge such continuing violence and its origins? To make this assessment, we have to acknowledge that Islam, in principle, is actually and potentially violent throughout its entire history. The basic reason for this method is obedience to the Law of Allah, not love for violence itself. On the basis of evidence and theory, we cannot conclude from the fact that Islam is a “religion” that therefore it is not “violent” or is so only by abuse of its own founding. It is possible to be a religion and to espouse violence. (Were this not so, we would have to exclude many key passages on the Old Testament itself.) We cannot obscure what is there and affirmed to be there by Muslims themselves. Realism means that we can and should call what happens by its proper name. It also means that, if we cannot or will not make this proper naming, we are not realistic. We will inevitably suffer the consequences of our failure to state the truth of what is there. These things are said not to promote counter violence against Muslims or to justify Muslim violence against others. Rather it is to respect Islam’s insistence that all those inside and outside of its enclosure be subject to the law of the Prophet. Whether we like it or not, this vision of world rule that is proper to Islam can only be called “religious” in nature. It is rooted in and promoted as a worship of the god called Allah. Not to take this wording seriously is unrealistic. The Muslims who claim that they can read their religious texts as if such violence is not advocated and justified may be applauded for trying to mitigate the historic record. But the fact is that those who see this violence as essential to the religion have the better side of the argument and are the better witnesses to what historic Islam stands for. What is argued here, then, is not to be unfairly “critical” of Islam. On the contrary, it is written with considerable admiration for the zeal, consistency, and effectiveness displayed over the centuries by Islamic armies and law. And while it may be politically incorrect to state these things, they need to be stated and are in fact the truth—things that both Muslims and non-Muslims need to hear and consider. The designated and determined goal of the conquest of the world for Allah has been reinvigorated again and again in world history from the time of Mohammed in the seventh century. These revivals and expansions, which have only been temporarily halted by superior counterforce, have roots in the Qur’an itself and in its commentaries. What we witness today, much to our surprise, is but another step in the historic world mission that Islam envisions for itself as the will of Allah, a goal that inspires the real and recurrent vigor that is found in its history. The reason we do not call it what it is lies not in Islam but in our own very different concepts of philosophy, religion, and law. In this sense, it is our own culture that often prevents us from being ourselves political realists. Many believing Muslims, likely more than we are willing to admit, are tired and frustrated at having their religion’s principles denied. Outside observers are unwilling to believe or imagine that what Muslim advocates say about themselves, both in their founding texts and in their historic actions, is true. World conquest over time is what they hold must be achieved. In other words, whether they be Muslim or otherwise, many people refuse to acknowledge that violence is proposed and carried out in the name of Islam. Outside Islam, it is called by the peculiar word “terrorism”. It is rarely called what it is, namely, a religious endeavor to conquer the world as an act of piety. Muslims, in this central tradition, are not “terrorists” just for the fun of it. That is insulting and resented. They practice what we call “terror” because they see themselves carrying out the will of Allah, even sometimes to their own death in doing so. Those who, in the process, kill “infidels”—that is, any non-Muslim or Muslim who does not accept true Islam—is considered to be a “martyr” to the cause of Islam. Only if Islam is not true can these ritual killings be seen as the objective evil that they are. A subtle philosophic theory (called “voluntarism”) purports to justify this usage of what we call terror for religious purposes. The principle of contradiction cannot hold in a “revelation” that contains, in its texts, contradictory commands, as does the Qur’an. Allah then must become pure will, not bound by Logos or reason. Hence Allah is not limited by any distinction of good and evil. The Muslim blasphemy laws that threaten with death anyone who violates this claim arise from this source. Allah’s mandate to Islam is progressively to subject the world to his will and to the law based on it. Terror will end and true “peace” will result only when all are submissive to Allah and live under Muslim law in all its details. What we outside of Islam call acts of violence are considered within it to be the carrying out of Allah’s will. 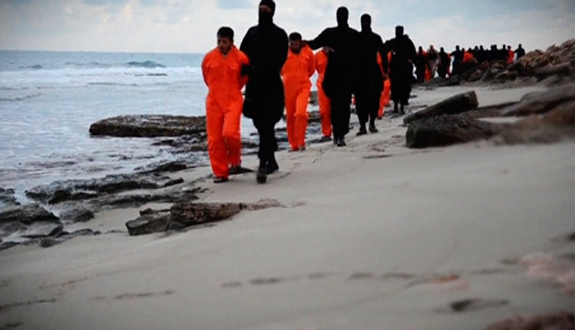 Gruesome beheadings of Christians, however innocent, are seen as acts of justice. They are acts of “virtue” in this sense. The people who cannot understand this religious charge given to Islam, whether they be themselves Muslim or not, are themselves both unrealistic and dangerous. Their own presuppositions prevent them from recognizing and judging the real issue. They also prevents them from doing anything effective to hinder this expansion of Islam into Europe, Asia, Africa, and America. Back in 1975, I wrote an essay in the Modern Age entitled “On the Teaching of Ancient and Medieval Political Theory”. The gist of this essay was that unless we understand the content and history of religions—their truth claims and aberrations—we will be unable to see the actual forces that swirl through the political world. An education that lacks a proper and accurate study of the theology and theologies peculiar to each different religion is not really an education. It could not prepare anyone to deal with a world in which religions, in their differences, are a reality. Both in Europe and America in the last half century or longer, this sanitized education is what decades of students have been given. With it, most citizens are simply not equipped to face the forces now reappearing in the world. Indeed, even to propose a realistic look at Islam, as is proposed here, is almost everywhere forbidden and excluded from any consideration, however valid the analysis. This neglect of or hostility to religion has come back to haunt us. We have lumped all “religions” together as illusions or myths. They are to be defanged and wholly subject to state power. Our political, academic, and cultural leaders cannot comprehend what is going on, either when a whole Western civilization loses its faith and moral standards or when Islam reawakens to the implications of its own faith and its vision of world conquest. The two—the loss of faith and the rise of Islam—are connected. The decline of the birth rate and civil undermining of the family in the West is one thing. Muslim immigration or invasion has engulfed this same area. Muslims, especially young males, did not seek power and prosperity in other adjoining Muslim lands. The expansion of Islam was justified also by its charge of moral decadence against the West. We see well-equipped modern armies, with inept and not seeing political leadership and with little motivation of forces, out-fought by young armed zealots in pick-up trucks who can, with their followers, threaten every train station and public building in Europe, Africa, Asia, and America. As they planned, they have managed to turn the whole world into a battleground of fear. The cry “Allah be praised!” is heard after every act of destruction. It is quite clear by now, or should be, that no cultural artifacts—be they books, buildings, statues, or paintings—will be allowed to exist. They are seen to be contrary to Allah’s will, no matter what they are or when created. In this sense, the Pyramids, the Buddhist statues, the library in Timbuktu, the Vatican, and the monasteries in the deserts, Canterbury, the towers in New York, the kosher markets in Paris, and the airports in Brussels are equally subject to destruction. Everything must be protected because everything is now threatened. Not only are individual Christians eradicated but so are the statues of their saints. The reason for this destruction is “religious”. Such things ought not to exist. We have here a literal application of the belief that nothing should be allowed public or private space that does not correspond with strict Muslim beliefs. Provisional tolerance of Christians and Jews if they accept second class citizenship and pay heavy fines is merely temporary until the conquest is complete. Such zealous destruction to do the will of Allah, in other words, is considered to be an act of piety. If someone is going to oppose such acts, it cannot be done on the grounds of opposition to “terror” or that it is unreasonable. Ultimately, it depends, as Augustine learned with the Donatists, on a conversion and rejection of the theology that justifies it. Whether Islam, in its origins, is a rereading of Jewish, Nestorian, and Christian texts (as it probably is) can be disputed. First, Islam claims to be a literal revelation of what is in the mind or being of Allah. In this sense, what is in the text must always remain in the text. It cannot be changed or “reinterpreted” to leave out those multiple passages that propose and justify violence in the name of the expansion of this religion. This advocacy of violence, which has been practiced in Islam from its seventh century beginning, has a purpose. This purpose is, ultimately, religious and pious. Whether the Muslim notion of “heaven,” where its martyrs go, is primarily this-worldly or transcendent, can also be disputed. In any case, the concept of heaven is very earthy sounding. This picture is not, as such, an argument against its truth. The message contained in the Qur’an is that the world should bow in submissive worship to Allah. This purpose abides and recurs over the centuries because it is there in the text. Men may temporarily neglect its zealous pursuit, but the text itself always contains the mission for others to find and pursue. There will always be those who realize that the mission of world conquest in the name of Allah is not complete. This realization is why, so long as it exists unrefuted, the Qur’an will always produce what we call “terrorists”. What we see now is little different from what has been seen throughout the centuries wherever Islam is found. In this view, the world is divided into an area of peace and an area of war. The former is where the law of Allah rules politically, religiously, and culturally, where no other philosophy or faith has any right to be present. All signs of alien religion, art, artifact, and people are eliminated through forced conversion or death. Sometimes, Christians and Jews can be allowed to stay alive provided that they accept second class citizenship and pay taxes. This situation, in practice, is the basic constitutional rule in all existing Muslim states, even in those that reject ISIS or other approaches to eventual conquest of the world. Once Islam has conquered, it has always followed the same principles. In its history, certain famous battles have turned back Muslim conquests for a time, sometimes for centuries. But this relative inertness is only on the surface. As long as the book exists, its goals will again and again inflame prophets, imams, politicians, and the young men to recommence the conquest of the rest of the world. In conclusion, what is argued here in terms of political realism is that we must understand the religious nature of Islamic expansion and the methods used to achieve it. By trying to abstract these motivation from the soul of this particular religion, which is, on this score, unlike most others, only makes it impossible to describe what in fact is going on in the mind of the adversary that is Islam. Wars are first fought in minds—and this is a war. It is not World War III; rather, it is an extension of the wars that Mohammed first launched against Byzantium, Persia, Syria, eventually North Africa, even to India, Spain, the and Balkans. The Muslim protagonists of today realize how close they were several times in the past to conquering Europe as the next step in world conquest. What they see today is a very realistic opportunity to succeed where their ancestors failed. They, though also idealists, are (often unlike ourselves) realists. That is, they see what our minds really hold. And they see that they are largely empty of what really counts in this world: a true conception of God. Their only fault is that of choosing a false understanding of the real God. Aside from this “small” issue, one cannot help but admire, and fear, a blind faith that so abides over time and place without the real presence of the Logos whose incarnate presence in the world is explicitly denied. Then: Dinesh D’Souza leaves Catholic Church. Now: He leaves wife.